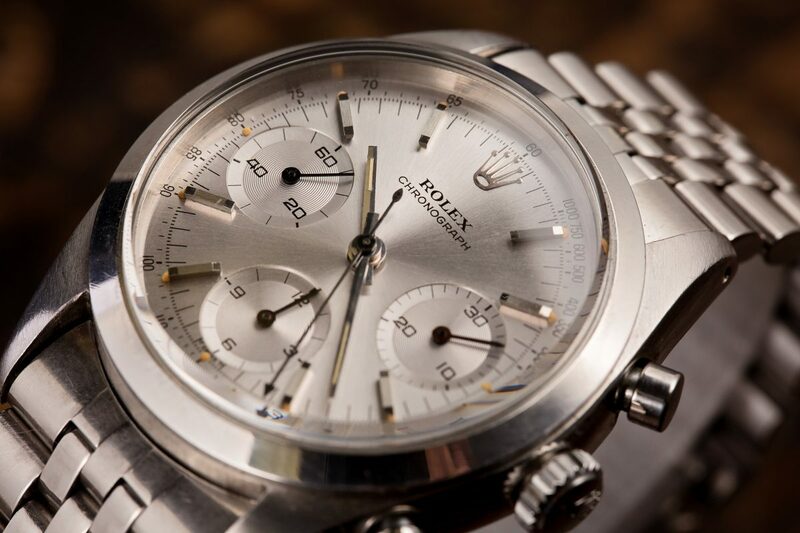 Today, Rolex’s chronograph line of watches is known as the Daytona; however, Rolex was manufacturing wristwatches with chronograph complications long before the Daytona name ever made an appearance on a Rolex dial. 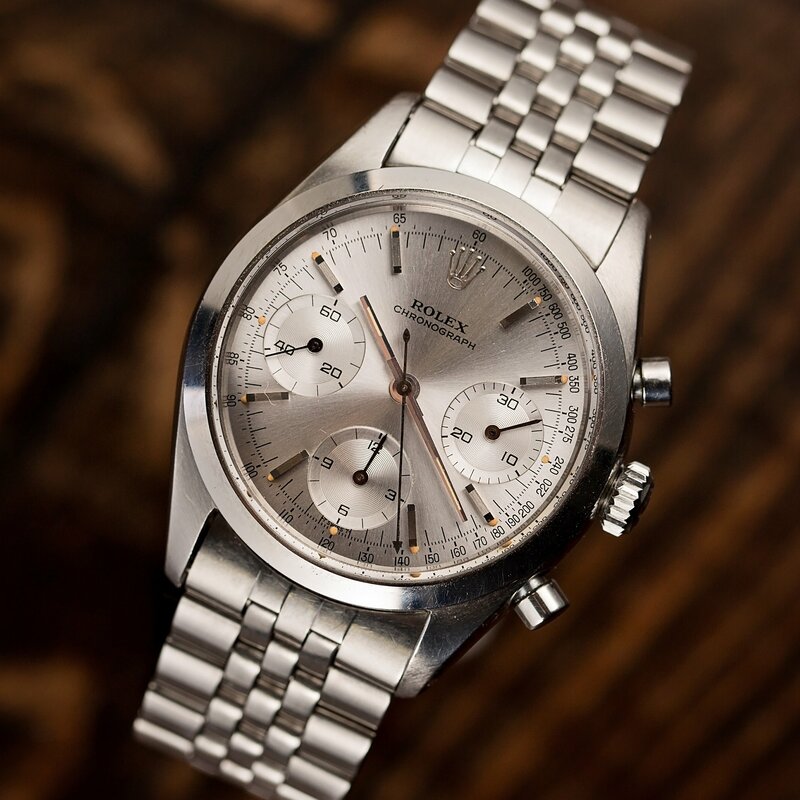 One rendition from the 1960s, the reference 6238 is most commonly known as the “Pre-Daytona” because it sits at a turning point in design, when Rolex’s chronograph first started to take its now-iconic form. The reference 6238 marks the adoption of the clean, contemporary aesthetic that became the foundation for the design of the modern Daytona Rolex. The reference 6238 was fitted with a monochromatic dial in either black or silver, with faceted hour markers, and baton-style hands. Although the tachymeter scale was still printed on the dial rather than being engraved on the bezel, Rolex eliminated the telemeter scale entirely from the reference 6238, giving the watch a more modern and less cluttered overall appearance. The relocation of the tachymeter scale from the rim of the dial to the external bezel represents the real founding act of the Daytona; however, since the reference 6238 embraces a modern design for its dial and hands, the watch is frequently referred to as the “Pre-Daytona” for its transitional placement within the evolution of Rolex chronographs. The reference 6238 was manufactured during the 1960s, with an estimated production period of roughly 1962 to 1968. 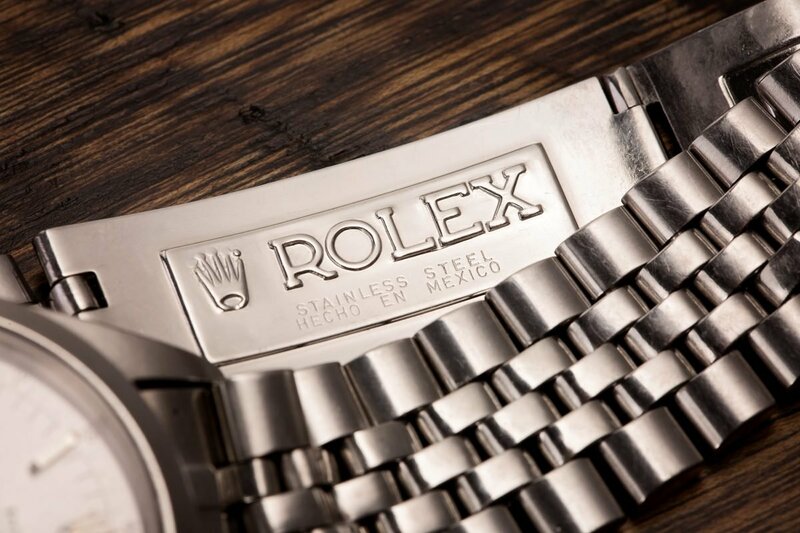 The reference 6238 is a rare Rolex reference, and it is estimated that 2,000 to 2,500 examples (including all dial and precious metal variations) are to have been manufactured. In 1969, a young pilot purchased a pre-owned Rolex reference 6238 from a fellow aviator who felt that the appearance of his reference 6238 was a bit too plain, and who wished to own a new Seiko chronograph instead. The young pilot was familiar with Rolex watches from the numerous advertisements that he had seen in Scientific American Magazine while in college, and purchased the reference 6238 so that he could have a reliable timepiece while flying. The young pilot would go on to wear that reference 6238 as his daily watch for many years thereafter, especially on days when he was scheduled to fly. Eventually, after an extended period of lusting after a Rolex GMT-Master, the pilot confessed to his wife that he had always wanted a GMT, and she purchased one for him as a birthday present that year. After receiving his GMT-Master, the pilot began wearing it as his new everyday watch for the next several years; however, he would still occasionally wear his reference 6238 because he viewed it as a trusty tool that had always reliably performed for him while he was flying and needed it most. The decision to sell his reference 6238 came years later, after the pilot received an appraisal for the watch and learned of its value and collectible nature. By this point, the pilot owned other watches, and felt reluctant to wear his reference 6238 due to the inflated costs and consequences associated with potential, inadvertent damage. Eventually, the pilot felt that it was time for the watch to continue with its journey, and made the decision to sell his reference 6238 to us at Bob’s Watches, so that he could give someone else the opportunity to be able to appreciate it in the same way that he had for all those many years.